Running for Weight Loss is a unique weight loss plan, a mix of effective interval running, jogging, walking and sprints. A great tool for achieving different fitness goals and levels: it’s running for beginners and those who are intermediate and advanced runners. Includes a running map, an activity tracker and a calorie counter. WALKING FOR WEIGHT LOSS: one of the weight loss plans, aimed at burning calories, improving health. Made up of warm up, walking and cool down. Great for those who have any health conditions or prefer sedentary lifestyle. START RUNNING: training program designed for those who are new to running. 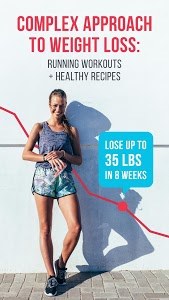 RUNNING FOR WEIGHT LOSS: a weight loss plan which helps you burn fat and lose weight fast. RUN 5K: a running plan, guided by a couch to 5k. RUN 10k: 10k running plan, guided by a couch to 10k. HALF MARATHON: a half marathon training plan for those who want to get ready for 21k running. Your individual couch to half marathon. MARATHON: a marathon training plan for those who want to get ready for 42k running. Your individual couch to marathon. A great workout option if you want keep running without sticking to any workouts plan but tracking your runs. 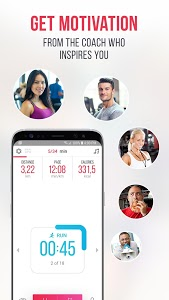 You will track your run with gps running and an activity tracker. You’ll get a meal plan for weight loss with 4-course meals (diet menu) and step-by-step food recipes + a shopping list for each meal plan. 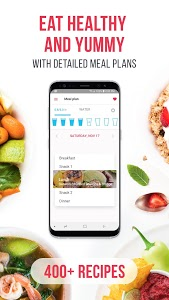 Water tracker serves as your hydro coach and helps you drink water throughout the day (water reminder), maintain health and nutrition balance. BODY TRANSFORMATION is a great fitness motivation! Multiple Before-After pictures combined in a video allow see your visible weight loss. PERSONAL COACH: choose a running coach up to your choice, from nice and caring to rough and military. A personal trainer guides you through a running exercise and helps you keep on track. 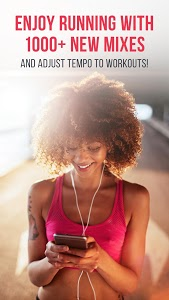 WORKOUT MUSIC includes 1000+ fresh mixes of different genres, from classical to hip-hop. Workout music is your true fitness motivation: it fuels you with energy and makes your fitness workouts effective. With TIPS you will learn how to lose weight fast and properly, how to burn calories, choose shoes and apparel, create running route and running plan etc. There are also nutrition and diet tips to help you maintain health, get aware of diet plans and meal planner advice. 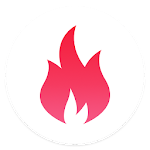 DETAILED WORKOUT STATS: your pace tracker, calorie counter, distance tracker (km and mile tracker), time tracker. Running workout can be done both on a treadmill and outdoors. 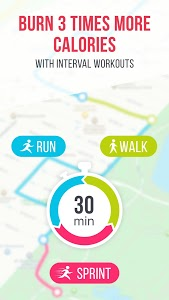 SYNCHRONIZATION with Fitbit and Runkeeper. If you upgrade to a Premium Membership, payment will be charged to your Google Wallet account at confirmation of purchase. Your monthly subscription is $9.99 per month, while the yearly subscription is $49.99 per year. (Price may vary by location.) Your subscription renews automatically unless cancelled at least 24 hours prior to the end of the current period and cancellation of the current active subscription period is not allowed. This app is developed for informational purposes only. You must always consult your doctor before starting any fitness program. Similar to "Weight Loss Running by Verv"